If you have read any of my previous posts about Agincourt you’ll know that I’m slightly cynical about the overwhelming effect of the longbow commonly attributed by historians and novelists. The famous longbow, at 6 foot in length required great strength and skill to draw and use properly and is usually seen as the weapon of choice for English archers throughout the hundred years war from 1337 to 1453. According to historical myth it was responsible for the destruction of French armies at Crecy, Poitiers, Agincourt and a host of smaller battles. a) Bad French leadership and disorganization on each occasion. b) Well drilled combined arms strategy from the English – although outnumbered there is evidence that the English wanted the French to fight them as they knew they could defeat them. c) The professional and battle-hardened troops of the English army – troops in the early years had gained experience from wars in Scotland, and retinues were raised on the basis of pay rather than as a feudal array. The archers were an important factor and together with well armed infantry men-at-arms they could defeat the French. Did you know that the only archaeological evidence is from the Mary Rose, Henry VIII‘s ship, which sunk in 1545. There is some pictorial evidence of long bows being used, but those troops hired for the hundred years war are only ever described as archers and no mention is made of the size of their bows. 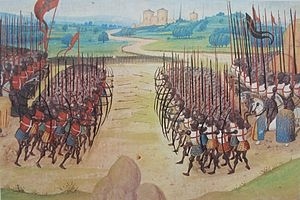 The English archers were no doubt well trained and good at their job of disrupting the French ranks, but did their weapons really have the devastating killing power ascribed to them?